A Lockheed Martin (NYSE: LMT)-Northrop Grumman (NYSE: NOC) joint venture has secured contracts worth $170.5 million combined to supply fire control radar components for the U.S. Army‘s lots 7 and 8 Apache AH-64E helicopters. 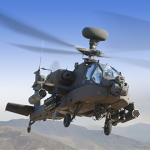 Longbow will supply FCR mast mounted assemblies, radar electronic units and spares to the Army as well as Saudi Arabia, Qatar and the U.K., Lockheed said Wednesday. The radar is designed to automatically search, detect, locate and classify multiple land-based or airborne targets in clear or adverse surroundings. Jim Messina, president of Longbow and director of Longbow programs at Lockheed’s missiles and fire control unit, said REUs could serve as the foundation for extended range, maritime mode and unmanned aerial system detection features. Production of the FCRs will occur at Lockheed’s Orlando and Ocala, Fla., facilities and at Northrop’s Baltimore, Md., facility through April 2021.